Sweet Cheeks Adventures: Strawberry Shortcake Prize Pack Giveaway! Strawberry Shortcake Prize Pack Giveaway! 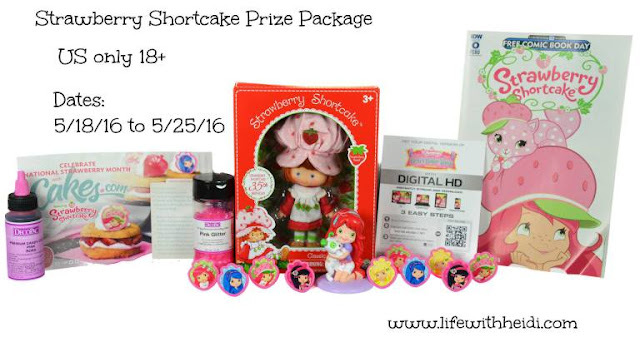 Welcome to this awesome giveaway of a Strawberry Shortcake Prize Pack hosted by Life with Heidi! If you haven't seen my Shortcake Donut Recipe you can check it out here. The folks at Strawberry Shortcake and DecoPac are sponsoring this great prize pack with everything you see here! A classic Strawberry Shortcake doll: This is a special-edition reproduction of the original doll from 1980 that includes all the original details from her hat to her shoes – including her berry sweet strawberry scent. Strawberry Shortcake cake decorations: the perfect topping for your donut recipe! Strawberry’s brand-new comic book: Strawberry and her friends celebrate “A Berry Big Anniversary” in this all-new and original comic adventure. Strawberry Shortcake movie: Take Strawberry’s adventures to another level of fun with an all-new digital movie. This giveaway will run from May 18-26 12:00 am est. Open to US Only and you must be 18 years or older to enter. One winner will receive this awesome Strawberry Shortcake Prize Pack!